Wear your blue, white and red, grab a sparkler, bite into a hot dog, see some fireworks and partake in all the traditions that surround July 4, our Independence Day. You can use our “Fireworks Finder,” to see where the fireworks will be going off in D.C., Maryland and Virginia. You can also check out our list for all the parades happening in the DMV. Today is a day to be with family and friends and commemorate our nation’s birth. Metro trains are always crowded on Independence Day, but with the holiday falling on a Saturday, trains are expected to be especially packed this year. "Historically, on a Saturday we tend to have a lot more people who go out on the Fourth of July," Metro spokeswoman Sherri Ly said, noting that 600,000 to 700,000 riders are expected. Officials advise riders headed to the National Mall to exit at a station not directly on the Mall, like Capitol South or Federal Triangle. Don't want to spend your Fourth of July waiting underground for a train? 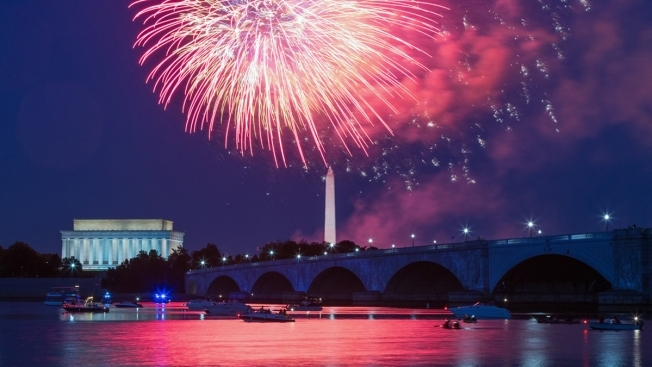 This weekend travel guide will help you glide through the Metro’s tunnels and bus routes as you celebrate our nation’s birthday in our nation’s capitol. Friday, July 3: The Metro is open from 7 a.m. until 3 a.m. and trains will run on the Saturday schedule. Parking is free at all Metro-operated facilities. Off-peak fares are in effect all day. Customer service will be closed. Saturday, July 4: The Metro is open from 7 a.m. to 3 a.m. and trains will run on the Saturday schedule until 2 p.m. and then rush-hour service levels will ramp up before and after the fireworks. Off-peak fares are in effect all day until midnight. From midnight to 3 a.m., peak fares will be in effect. The Silver Line will only operate between Wiehle-Reston east and Stadium Armory, leaving out the Benning Road, Capitol Heights, Addison Road, Morgan Blvd. and Largo Town Center stops. You will need to use the Blue Line to go east of the Silver Line. Parking is free at all Metro-operated facilities. Customer Service is open from 7 a.m. to 8:30 p.m. by calling 202 637-7000. Due to the crowds, bicycles and large coolers are not permitted. It's a good idea to travel light. Exiting on the Mall: The Smithsonian station on the Silver, Orange and Blue Lines is the closest station to the National Mall. The stop is open all day, although after 9:30 p.m. it will become entrance-only. Metro suggests you pick only one line to travel on to reduce traffic on platforms. Other stations near the Mall include Metro Center, Federal Triangle, Archives, L’Enfant Plaza, Judiciary Square, Federal Center SW and Capitol South. Make sure to check the map before you leave to find the station closest to your event. On both Friday and Saturday, Metrobus runs on the Saturday schedule. On July 4, expect detours around the National Mall. Metro Bus routes 30N, 30S, 32, 36, 39, 52, 54 and 74 all operate along the perimeter of the Mall at various locations. You can always find out when the next bus is arriving at your stop by using Next Bus and entering your location information online. It may not be as accurate due detours. Note that the D.C. Circulator National Mall Route will not operate on the Mall on July 4. The Circulator's Twitter account said Tuesday that the route would not operate "due to security reasons." You can use Trip Planner to calculate your exact fare for the day or you can purchase a One-Day Pass which gives you unlimited trips on Metrorail throughout the day. Make sure your SmarTrip has enough money for the day so you don’t have to get caught up in the crowds around the fare card machines. All road traffic will be posted on our traffic page throughout the weekend. For the latest Metro updates, you can follow Metro on Twitter or sign up for Metro Alerts.